Cliradex™ is the next generation lash, eyelid and facial cleanser derived from key constituents of Melaleuca alternifolia, a special variety of tea tree oil. 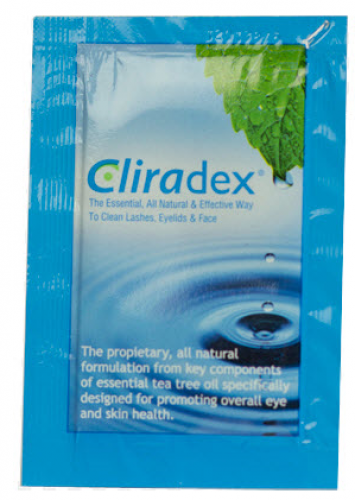 Cliradex uses a preservative free, all natural formulation of tea tree oil specifically designed for cleaning lashes, eyelids and the face without any harmful chemicals. The components found in Cliradex have been studied extensively around the world and have demonstrated numerous eye, skin and overall health benefits. 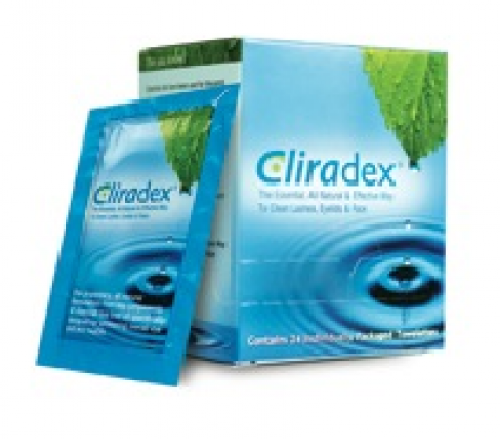 Using Cliradex as directed is an effective way to keep your eyelids and skin clean, comfortable and healthy. A commitment to regular eyelash and eyelid skin cleansing is important for people with eye conditions like blepharitis, ocular rosacea, dry eye, conjunctivitis and other eye disorders. Cliradex is made from the best nature has to offer. The key ingredient in Cliradex is simply water and 4-Terpineol, a natural organic compound found Melaleuca alternifolia. The other ingredients in Cliradex are in less than 1% of the patented formulation and are Glycerin, Polysorbate 20, Polysorbate 80, Carbomer, Triethanolamine.